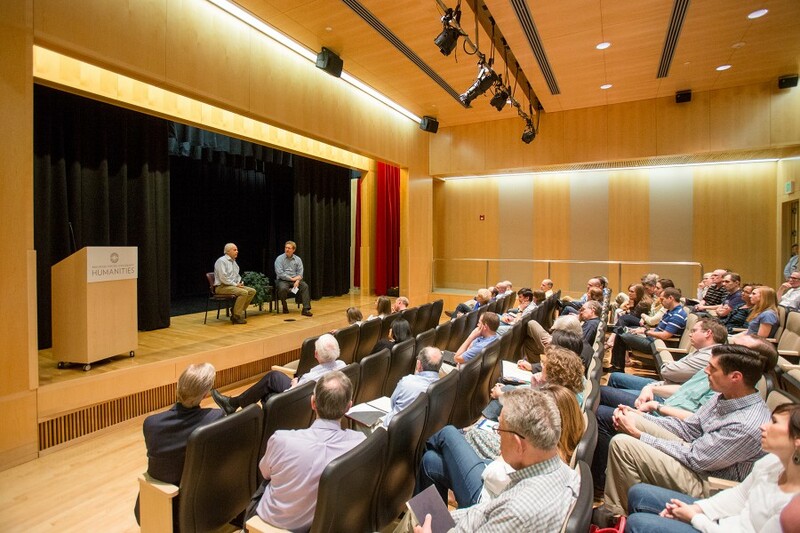 The College of Humanities’ community joined together to reflect back on the work done by outgoing dean John Rosenberg and outgoing associate dean Gregory Clark and to look forward to the future of the college. 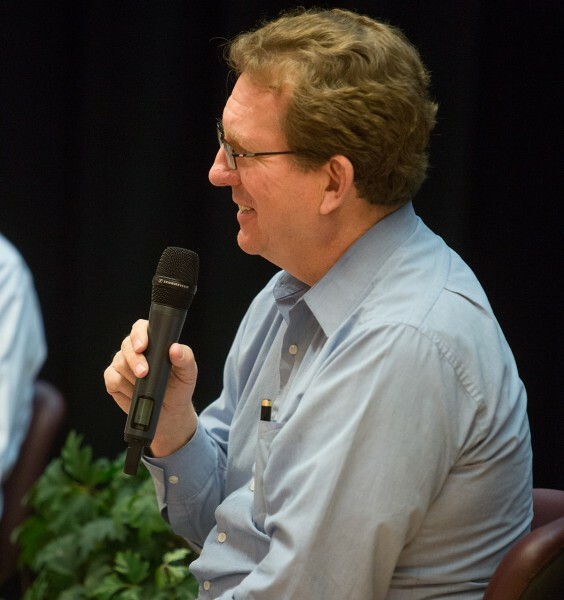 PROVO, Utah (May 29, 2015)—Outgoing dean John Rosenberg and outgoing associate dean Gregory Clark reflected on their years of service at a Q&A discussion sponsored by the Humanities Center. Its Director, Matt Wickman, moderated the discussion that included faculty, staff, and students. Wickman, began by asking them about what he considers the three biggest things that happened during Rosenberg’s time as dean, namely the creation of Humanities+, the founding of the Humanities Center, and the College’s leadership in the university-wide project of systematic assessment of student learning. Asking where the initiative on those projects came from Rosenberg stated that they didn’t have a master plan when they started, but that they were not standing without a foundation. Clark followed up Rosenberg’s comments. “[Rosenberg] had a vision to make the college really good and to support faculty in every way and to support students in every way that would make them more self-aware of what they are doing in taking a degree or program in the fields that we study,” he said. Clark also noted that it was Rosenberg’s idea to show students how the humanities can connect to careers that helped shaped the Humanities+ program into what it has now become. One question asked what perspective they gained on humanities students. In general, one thing they learned about humanities students is that they, as a rule, “are really passionate about what they’re studying but not very strategic about it,” noted Rosenberg. It was this understanding that guided them and their colleagues to step in and help provide a structure for students to see what to expect post-collegiately. “There are lots of individuals with very different stories,” said Rosenberg, including those described as non-traditional students (i.e., single parents, single mothers and returning students).. Rosenberg said that during monthly breakfasts the deans held with students throughout the semester they learned about the diverse needs of students, including some who, as Clark put, as sometimes “locked out” by the ways we are used to doing our business. Both agreed there is work still to be done.